Since the age of 16 I have had Lupus. For those of you who do not know what Lupus is it is an autoimmune disease in which your immune system attacks healthy cells and tissues. Yeah, it is not fun. But, I have been very blessed in that I have had very little physical debilitation from Lupus. For me, symptoms are like arthritis. My joints swell and are sore...especially in humid weather and changes in the seasons. I do NOT like to take medicine either. For me, vitamins are much better than a prescription any day. In fact, I attribute my good health now to all the vitamins and minerals that I currently take on a daily basis. Did you know that what you use on your body in way of skin care also affects your health? Our skin is like a sponge...it absorbs everything that comes in contact with it. Amazing, isn't it? God sure did design a beautiful creation when He made us, didn't He? Beeyoutiful was founded by Stephanie Walker Tallent. She lives in Tennessee with her husband Steve, and daughter Noelle. She and her family practice what they preach and I have enjoyed reading their articles in their catalog...very informative!!! What I really love about this company is the fact that they acknowledge Jesus Christ in their company values. I personally LOVE to promote companies like this and will do my very best to make sure I support them in their business. Beeyoutiful is really committed to providing healthy and pure options when it comes to herbs, minerals, essential oils and creams. I was very surprised at the inventory they carry...everything from charcoal products to baby body washes. For this review I was sent several products from Beeyoutiful's Laveshmint line. I was sent the Laveshmint Daily Moisturizing Lotion, Laveshmint Hydrating Toner and a Lemongrass Body Bar. The Laveshmint products contain a luxurious combination of lavender and mint...which make for a very refreshing and calming scent. So, the first product I tried was the Laveshmint Hydrating Toner. This product is a spray that you mist onto your face and neck after your daily cleansing routine. The astringent properties help to close your pores. I also read that this Hydrating Toner can be used to soothe sunburns and wounds. When I misted it onto my face it felt so cool and clean. It also smelled very good. I love mint so this was a perfect combination for me! This was very relaxing to use as well. Then, I tried the Laveshmint Daily Moisturizing Lotion and this was definitely a smooth and silky cream. I love how it is tinted pink and so it looks very "girly"...if you know what I mean. :) This moisturizer is perfect for sensitive skin as well and contains coconut oil and aloe vera to smooth your skin. It is also non-greasy which is really nice. I HATE greasy creams and do not like how they feel on my skin...especially on my face! The Lemongrass Body Bar is SO nice as well. I love how it is shaped like a bee hive! This soap would look lovely on your sink for the summer. It smells and feels very refreshing as well. I love the ingredients in this Body Bar too...raw goat's milk, vitamin E and free of chemicals and dyes. Truly a perfect and simple indulgence! 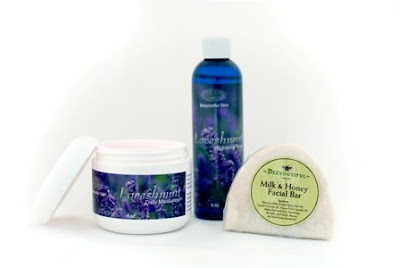 This Lavishment Skin Care set is available for purchase on Beeyoutiful's website for just $32.00. You can also purchase complete "packages" of products for specific needs. They have a Beginner Basics Essential Oils Pack (which I would love to try as I have heard so many great things about Essential Oils) as well as an Anti-Flu Pack, containing odorless garlic and other helpful herbs for flu season. I would love to try this as well. Visit Beeyoutiful and tell me a product you would love to try. You do not have to be a blogger to enter, but you must have a valid email where you can be reached should you win. If you do not leave an email address, it must be where I can easily find it. This giveaway is open to US residents and will end 6/3 at 11:59 pm EST. The winner will be chosen using random.org and will be notified by email. The winner will have 48 hours to respond, or another winner will be selected. 1. Become a GFC follower of My Opinion. Leave a comment to let me know that you did/ do. 3 entries, so 3 comments. 5. "Like" Beeyoutiful on Facebook. 2 entries, so 2 comments. 6. Vote for me on Picket Fence Blogs. Button is on the right hand side. 1 entry per day, so 1 comment per day. Disclaimer: I received no monetary compensation for this post. I did receive a Laveshmint Skin Care Pack for review purposes. All quotes are from the Beeyoutiful website and email. All thoughts and opinions are 100% mine. I'd like to try the Bee's Aid. I love Beeyoutiful! I have some of their vitamins. I would love to try the Tummy Tuneup. I would love to try the Hair Shine Spray-In Conditioner. I'd like to try the Hair Shine Spray-in Conditioner. I would like to try Miracle Skin Salve. Voted for you on the Picket Fence Blogs. I would like to try Eucalyptus Essential Oil. I really like the Hair Shine Spray-In Conditioner. Email in profile. The vanilla dream bar looks great! I'd like to try the Vanilla Dream Lotion Bar because it has a cool name! I want to try the All Natural Bug Spray! I would like the buttermilk baby bath. Their all natural bug spray looks great! And with this hot, moist summer I'm living in, I sure could use it! I follow you on GFC as AMD. I like Beeyoutiful on facebook, too. I'm Anne D.
I would like to try the Bug Me Not, All Natural Bug Spray! The Chamomile Essential Oil looks very nice! I tweeted about this giveaway at http://twitter.com/likwan/status/76859394721189888.